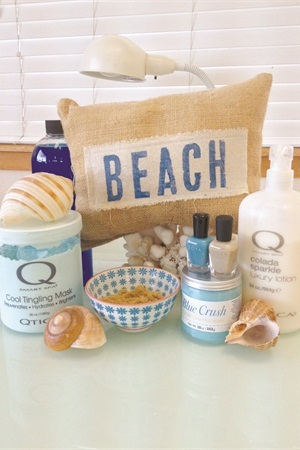 Beachy Toes uses: Qtica Cool Antibacterial Soak, Colada Sparkle Lotion, Cool Foot Mask; Naiad Beach House Soapy Suds Scrub; Diamancel #20 file; Zoya base coat, polish, top coat; organic brown sugar, almonds, jojoba oil, apricot oil. 2. Exfoliate the client’s feet and lower legs with a mix of Naiad Beach House Soapy Suds Scrub (Beachy Toes has it private labeled as “Blue Crush”) and homemade brown sugar scrub with organic brown sugar, almonds, jojoba oil, and apricot oil. 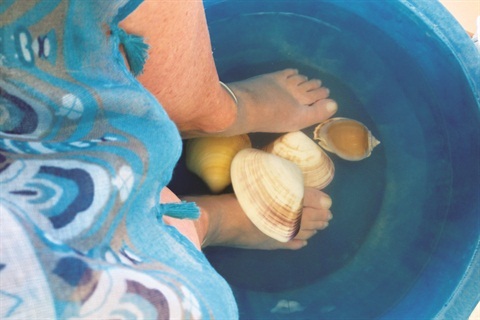 Wrap the client’s feet in lemon-scented warm towels, then remove the scrub with the towels. 3. Massage the client’s feet and lower legs with Qtica Colada Sparkle lotion. 4. Apply Qtica Cool Foot Mask to the client’s feet and lower legs for five minutes. 5. Prep the client’s feet and toenails, including using a Diamancel #20 file to smooth rough skin. 6. Apply Zoya base coat, two coats of polish, and top coat. By Beachy Toes, Solana Beach, Calif.